For lunch on Saturday, the homies and I biked to Garbanzo Mediterranean near Elisabeth’s work. Elisabeth wanted to see how to bike to her job so we did a trial run. It was even faster than I had anticipated and really easy – I wish my bike commute was that short. 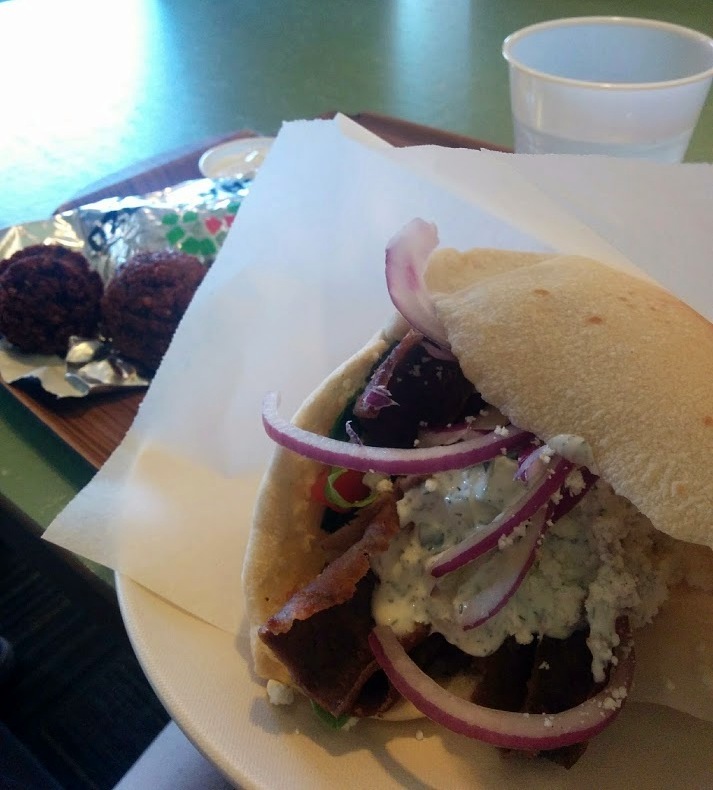 I had a gyro pita at Garbanzo and a side of falafel and it was delicious, so much better than Saj Mediterranean. I’m pretty sure this is where we’ll order food for our “wedding”. Next weekend we’ll go again with my parents and I’ll try something different and Gene can try a few different things as he only had one falafel. After we got back home Gene and I went to Lowe’s where we bought landscape edging to separate the rocks from the rest of our yard and I just happened to pick up more violas. I absolutely love violas and I’m determined to keep them alive for as long as I possibly can this year – hoping they can survive through the winter. For dinner I drove to Kaitlin and Kevin’s house where I had some homemade chicken tortilla soup (it was so tasty, especially with homemade guacamole and chips). Kevin left for an overnight shift at his EMT center and I spent the night to help Kaitlin with EG. EG refused to sleep for the first three hours of the night but she slept soundly from 10pm to 4am so that was good. She officially got up at 6:30am and the two of us hung out while Kaitlin slept some more. I read her some books and then Kevin came home around 7:30 so he held her while we visited. EG was an awesome baby this morning and was all smiles. 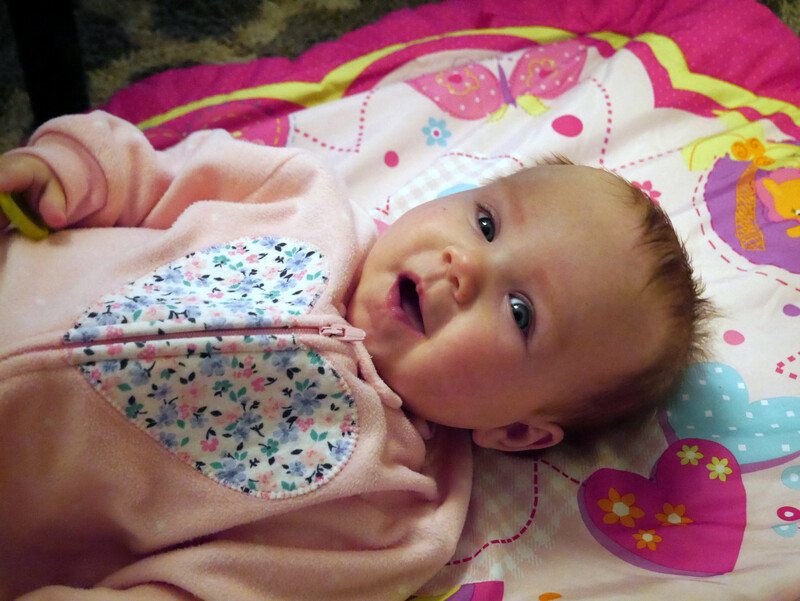 She just keeps getting bigger – although she is in the 10th percentile for weight. I got home around lunch time and after eating a bit I planted over half the plants I got this weekend and both yards are looking nice! Always more work to be done – still need to pull A LOT of weeds in the side yards – but I’m going to hold off on buying any more flowers. I am trying to keep in mind that the backyard and front yard do not have to be 100% done in two years. I can take my time and make little additions each year. Now it’s raining outside and we’re going to make two mac and cheese recipes soon before heading out to watch Guardians of the Galaxy 2! What a wonderful weekend. Next Post Mac and cheese night! You are such a good and loving sister, and an awesome aunt! That’s my girl, my precious daughter.